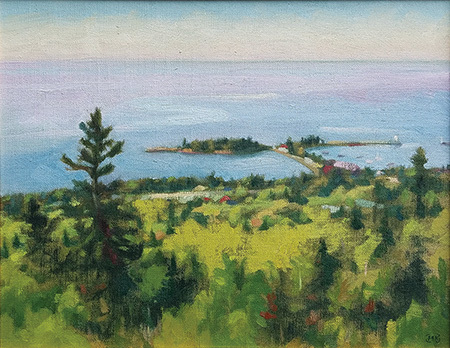 Artists Point– Finalist for the Bernie Quick Award (people's choice) in the 2018 Grand Marais Plein Air Competition. 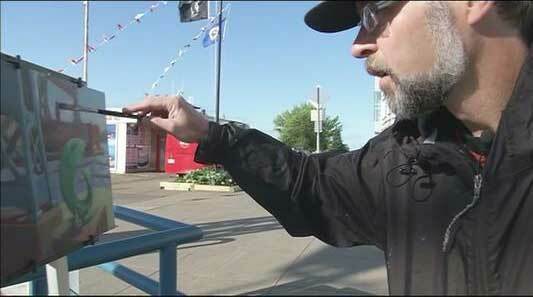 Guest Artist at Duluth Seaway Port Authority. Featured news item in North Star Port, an international publication of the Duluth Seaway Port Authority (see page 12 of PDF HERE). Recipient of Honorable Mention Award at 2017 Fine Arts Exhibition of the Minnesota State Fair. A second award for Best Custom Frame was also received. 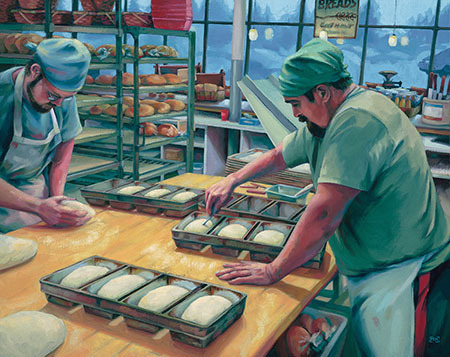 Forming Loaves – A featured painting in the 2017 Fine Arts Exhibition, a premier annual showing of Minnesota artists on view during the Minnesota State Fair. 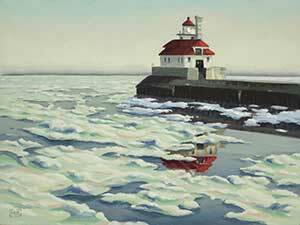 Juror for 2017 Plein Air Duluth: Paint du Nord competition. Five Awards and six Honorable Mentions presented. 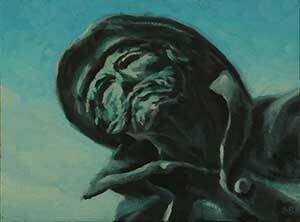 Featured Artist on Radio Gallery (KUMD-Duluth). Click here to listen. Printmaking – A featured selection in the 2016 Arrowhead Biennial, a regional juried exhibition. 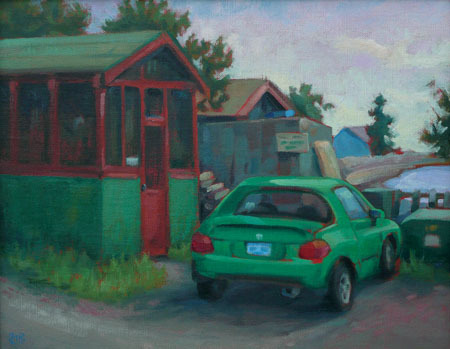 Kermit the Car – A Purchase Award selection at the 2016 Grand Marais Plein Air Competition and Exhibition. Third Place Award for Happy Duluth Day in 2016 Plein Air Duluth: Paint du Nord outdoor painting festival. 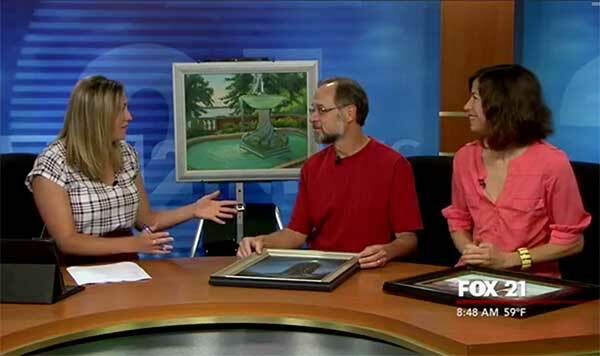 Featured artist again on local TV (FOX21-KQDS) – about Duluth's 2nd annual Plein Air Painting event. Exhibition at the galleries of the Duluth Art Institute until September 2016. Harley's World - 12x16 – A Purchase Award selection at the 2015 Grand Marais Plein Air Competition and Exhibition. 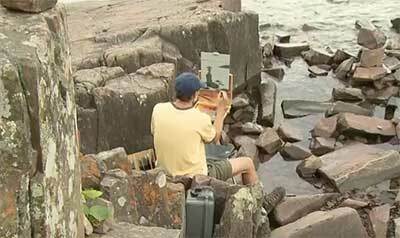 Featured artist on local TV (WDIO) – about Duluth's first ever Plein Air Painting event. 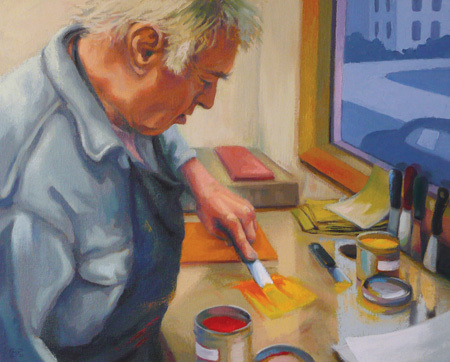 Exhibition at the galleries of the Duluth Art Institute until September 2015. 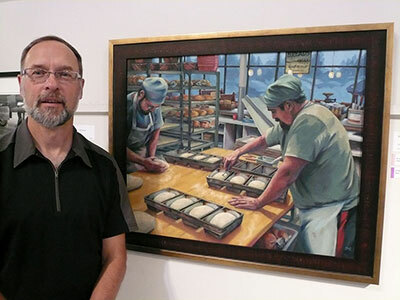 Featured artist in City Council Chamber at Duluth City Hall – painting on display was the People’s Choice Award from 2015 Duluth Art Institute Annual Members Show. 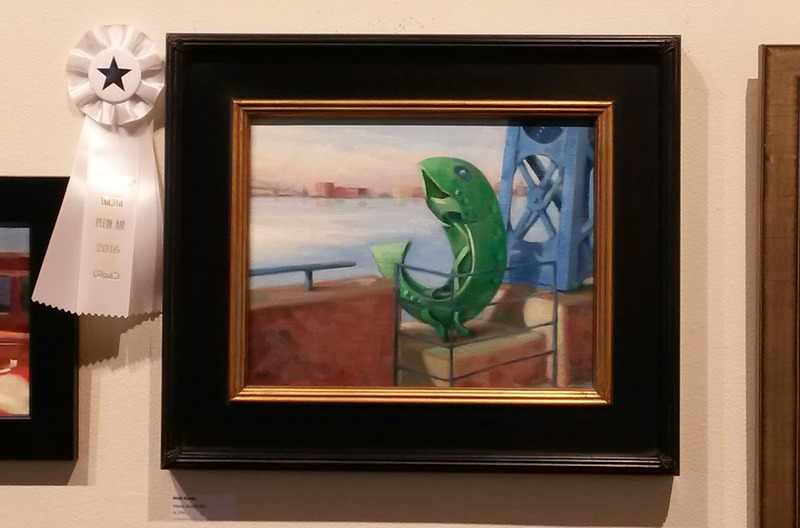 People’s Choice Award at 2015 Duluth Art Institute Annual Members Show. 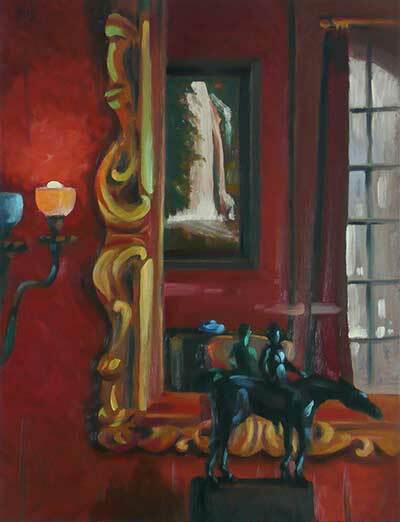 Winning oil painting: Doing a Painting. 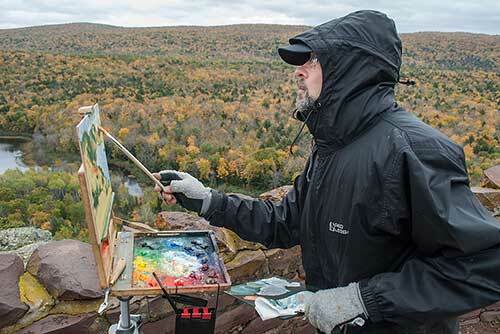 Media coverage of plein air painting at Upperpeninsula.biz an online feature story and interview on location in Porcupine Mountains Wilderness State Park in the upper peninsula of Michigan. 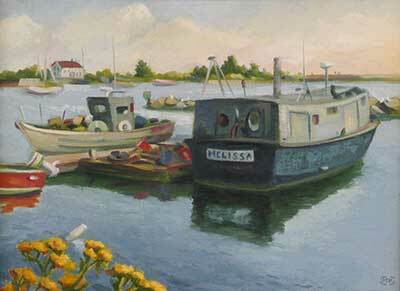 Second Place in Red Suspender Invitational – competition as part of the 2014 Grand Marais Plein Air Painting Competition and Exhibition. 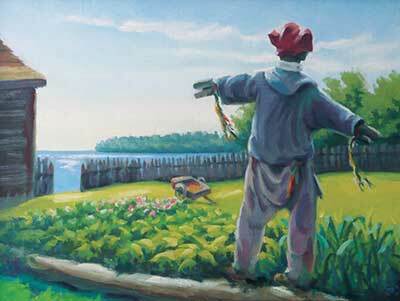 Featured oil painting: They Come From Montreal – painted on location at Grand Portage National Monument. 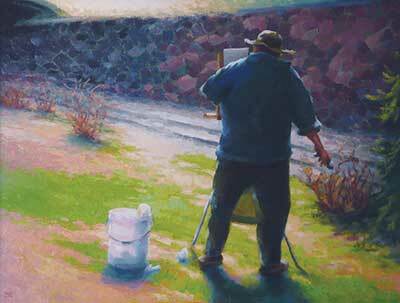 Finalist in Red Suspender Invitational – competition as part of the the 2014 Grand Marais Plein Air Painting Competition and Exhibition. 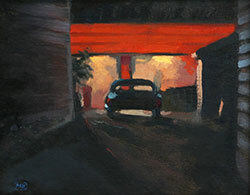 Advancing entry in main competition: Friday Night – nocturne painted on location in Grand Marais. 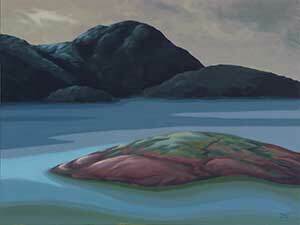 Invited artist at Glensheen Gala at Glensheen Historic Estate. Event included silent auctioning of four original oil paintings – painted on location inside the mansion in 2014. 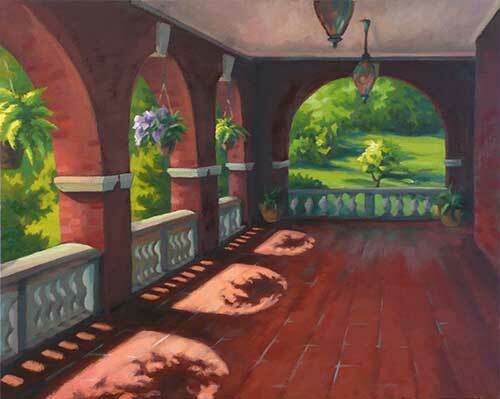 Invited to paint on location inside Glensheen Historic Estate. 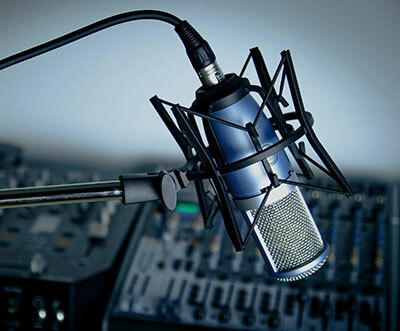 Featured artist on The PlayList, an award-winning arts and entertainment program produced by WDSE, Duluth-Superior regional Public Broadcasting Service. Plein air oil painting March Floe, featured in the solo exhibition Start Seeing Duluth, acquired by the Tweed Museum of Art for its permanent collection. 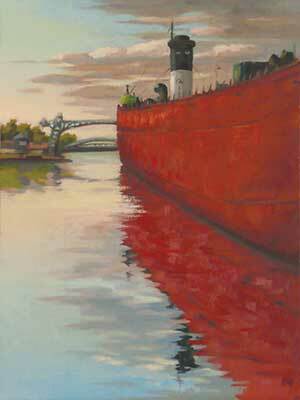 Start Seeing Duluth – Solo exhibition of plein air paintings of the Zenith City. Hosted by the Duluth Art Institute and sponsored by the Duluth News Tribune. 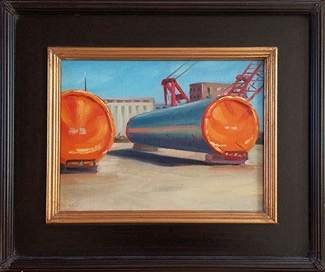 Awarded a $2500 Individual Artist Career Development Grant by the Arrowhead Regional Arts Council for a solo exhibition of plein air oil paintings, with the theme Start Seeing Duluth – on view from October 17 through December 31, 2013 at the Duluth Art Institute. 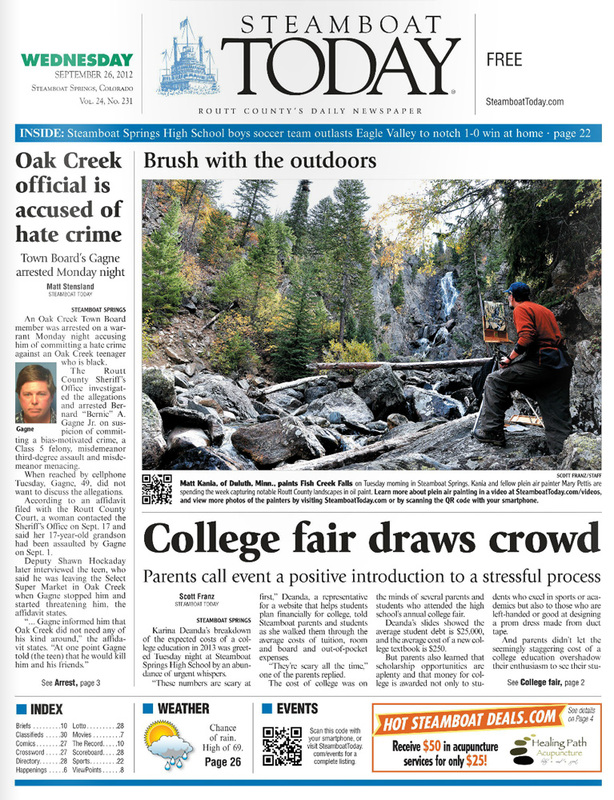 Featured on the front page of Steamboat Today (Sept. 26, 2012 issue), during a plein air painting trip to Colorado with fellow plein air painter Mary Pettis. See more photos at SteamboatToday.com. 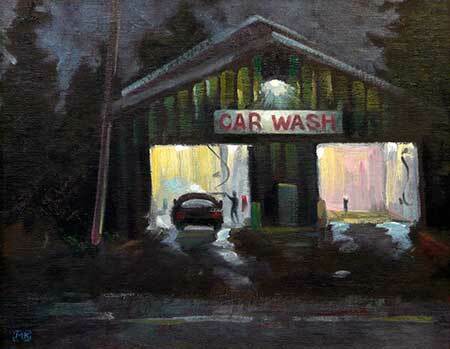 "Closing Time at DQ" – Recipient of the First Place award in the Night Paint category of the 2012 Grand Marais Plein Air Painting Competition and Exhibition. 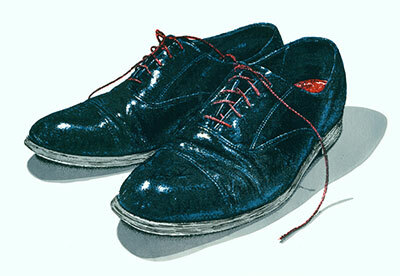 Lithographic print "Weddings and Funerals" selected for the 2012 Minnesota Fine Arts Exhibition, an annual juried exhibition of Minnesota artists at the Fine Arts Center of the Minnesota State Fair in St. Paul. 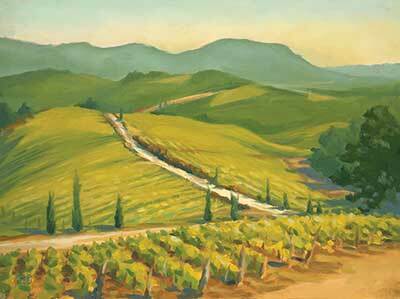 Three plein air oil paintings "Early Autumn, Tuscany," "Good Morning, San Fedele," and "Radda in Chianti" featured in The Eyes Have It, the 7th Annual national juried exhibition hosted by Il Chiostro in New York City. 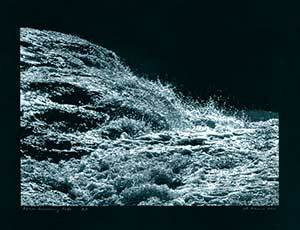 Lithographic print "Above Gooseberry Falls" featured in Stand Out Prints 2012, a national juried exhibition hosted by the Highpoint Center for Printmaking in Minneapolis. Two plein air oil paintings "September Light, Across the Susies" and "Cloudy Day, Pic Island" featured in A Sense of Place, a juried exhibition at the Minnetonka Center for the Arts. 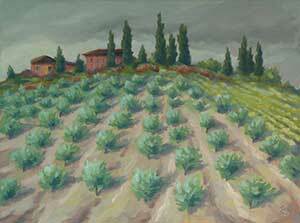 Invited participant in a Plein Air Painting Workshop with Mary Pettis in Florence and Tuscany region of Italy. 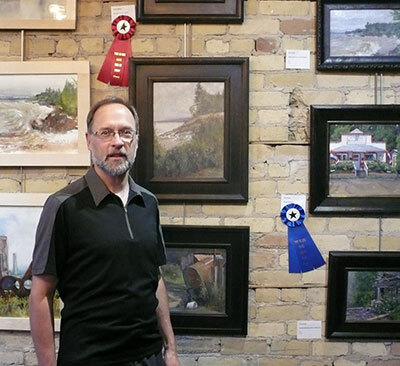 Recipient of the Honorable Mention award in the Quick Paint category for the painting "Rock Tower," featured in the 2011 Grand Marais Plein Air Painting Competition and Exhibition. One of several featured artists in The Plein Air Brush Off!, a special, Emmy Award-winning PlayList broadcast by WDSE, Duluth-Superior regional Public Broadcasting Service. 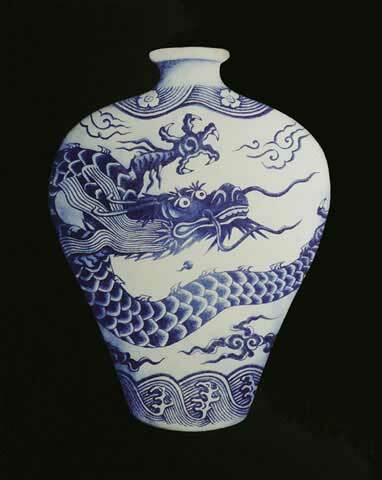 Intaglio print "Porcelain" acquired by the Tweed Museum of Art for its permanent collection. 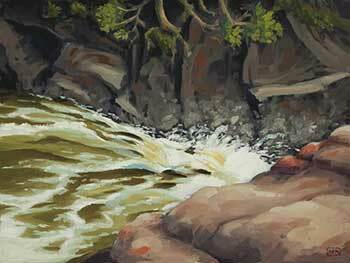 Plein air oil painting "Down the Cascade River" featured in the 2010 Arrowhead Biennial, a national juried exhibition. If you would like to be notified of upcoming exhibits, gallery shows, etc., please email me and let me know you want to be on my mailing list. © Copyright 2017-2018 Matt Kania. All rights reserved.